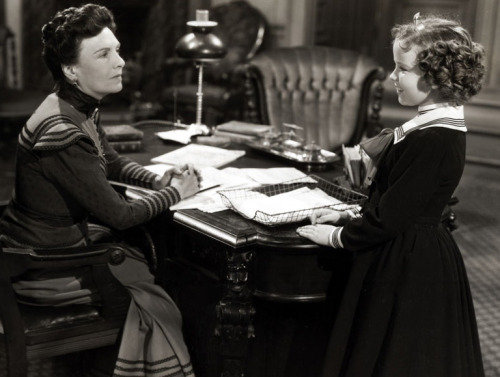 Frances Hodgson Burnett’s tale of a little girl trapped in an all-girls boarding school after her father dies holds a special place in my heart, but it’s not for this version of the Little Princess. I’ve always had an abiding love for the 1995 reboot of Burnett’s novel, changing the indefinite article from The to A Little Princess. You could say this minor title change sums up the differences between the two films, and it’s hard avoiding comparisons. Either way, Shirley Temple’s magnificent shadow ends up dampening the glow of Burnett’s work, installing far too many characters and lessening the suspense of the overall story. Sara Crewe (Temple) and her father travel to England where Sara is left at the Miss. Minchin Seminary while her father goes off to fight in the Boer War. When her father allegedly dies, Sara is left penniless. After of ruining the school’s reputation, Miss. Minchin (Mary Nash) keeps Sara on, but forces her to work as a servant. The Little Princess, both versions and the novel, work because of the fairy-tale nature of the story: Cinderella turns back into a pumpkin and has to prove she’s the owner of the glass slipper all over again. Where the 1995 version excelled was in giving Sara Crewe agency over events. When she loses everything, she openly defies Miss. Minchin and it’s her spirit that keeps her afloat. The reason this never gels in the 1939 version is Temple’s gigantic persona. You know things are going to work, no matter what. How can they not work? We’re talking about Shirley Temple here! Having known the machinations of the plot, it’s compelling having Temple go on a fruitless search for her father, leaving a bit of ambiguity that she wishes her father was alive, but with all the aid and encouragement, disbelief is hard to held. With the addition of several characters acting as intermediaries on Sara’s behalf, the character becomes little more than a figurehead for innocence and faithfulness. It’s not to say Temple is poor in the role, just lacking in any technique. There’s no reliance on previous Temple tropes like singing – although there is a song and a dream sequence – or her acting overly precious, although the final images is meant to kick you in the ribs with pure sweetness. Temple is best in the moments where she struggles to acclimate to her new status, although her scrunched up face isn’t a believable indicator of tears now matter how many times she tries. The princess image fits well on her, explaining why there’s a lengthy dream sequence of Sara as a literal princess complete with ballet where she’s the prima ballerina. This is Temple’s picture, completely, but Sara, as a character, is little more than a masthead. The final act, wherein Sara searches for her father with the aid of Queen Victoria, a statement already conjuring up images of England and its struggles as opposed to father/daughter fidelity. Add a final image of Sara saluting the Queen as “Rule Britannia” plays and the movie is little more than a propaganda film masquerading as a children’s literary adaptation. The rest of the cast is okay, but they’re all dry in comparison to Temple. Sara is the bright center of the film, leaving the other characters to either help or hinder her. Mary Nash marks her second appearance in a Temple feature after playing nearly the same character in Heidi. The remake attempts to give definition and backstory to the character of Miss. Minchin, but this version leaves her a materialistic matron of villainy out to stop Sara no matter what. The nice guys: played by Anita Louise, Richard Greene, Cesar Romero, and Arthur Treacher are colorful – the latter two – but bland overall. Marcia Mae Jones, another Heidi alum, returns as the spoiled Lavinia, a character you love to hate. The Little Princess is a fun, opulent movie, even if its exuberant in its virulent patriotism (understandable considering the era, but hard to ignore overall). Shirley Temple does what she does best, although she isn’t as colorful as the more despicable characters. This is a classic for a reason, but it’s worth it to watch both versions. There are three Shirley Temple movies I can watch without needing to have my blood sugar checked: HEIDI, WEE WILLIE WINKIE and this one. These three films don’t have musical numbers (although the last named does but since it is seen as a fantasy sequence if has a more organic feel than just having people break out in song) and seeing Shirley in a straight drama is a lot more appealing to me. I have always enjoyed this film, even if having Shirley in it pretty much guarantees that it will have a happy ending-I do like her interplay with the other characters, and you can tell that Cesar Romero and Arthur Treacher are enjoying themselves immensely. As per usual in one of her films, the romantic story is pretty meh, but the moment she realizes that she is in the presence of Queen Victoria is one of the best moments of any of her movies. The only good print I have ever seen of this is from the TCF DVD, since the copyright on the film expired there are tons of badly washed out prints that pop up for as little as $1 in stores. I assume that the Fox copy is off their 35mm Technicolor master, which I think was given some sort of restoration but this is a film that deserves a full chemical restoration to see Miss Temple in full color. I hope to get to Wee Willie Winkie at some point (I have pretty much all her adolescent films). I will say The Little Princess looked good albeit very muted in the color department. It was certainly better to watch compared to the colorized versions of her black and white features that were included in my box set. This definitely deserves a restoration although Fox is very slow at restoring. Thanks for reading!